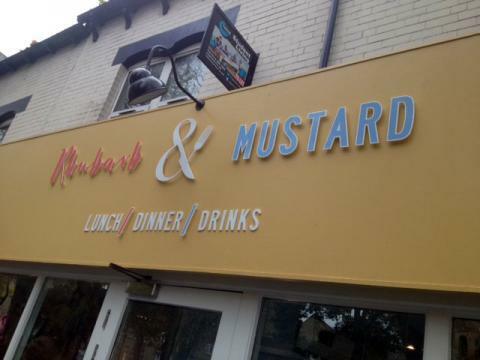 Smith and Baker on Ecclesall Road has recently, as I’m sure our beady eyed readers will have noticed, become Rhubarb and Mustard. Richard Smith solely owns and runs this now as one of his many Sheffield ventures and yet again it has taken off! Having recently done the signage for another of his ventures, Thyme Café, Richard asked us to do the signs for Rhubarb and Mustard and we were delighted to say yes! So we, Image Sign Studio, assisted in the two week long rebrand, by creating a Perspex sign mounted on studs enabling a nice shadow to be cast at the front of the restaurant and we created a new swing sign for him, too. We are exciting to be working with Mr Smith on multiple jobs at the moment, as, having just finished Rhubarb and Mustard he has asked us to create the signage for The Cow Shed which is going to adjoin Graze Inn at the end of the month, on which there will be more to follow and pictures for you to see. The aim is simple: to create the very best of food using locally sourced ingredients and working along the British farmers and suppliers wherever possible, with chefs that are just as passionate about cooking the food as the farmers are about producing it. It’s fresh, it’s heart-warming and it’s ultimately delicious. Would you like to find out more about shop signage? Are you wishing to rebrand, just like Richard Smith in this article, or give your retail property a facelift? Why not get in touch with Image Sign Studio and find out more about retail shop signs Sheffield? Contact our friendly and professional staff who are always more than happy to help you find exactly what you need so give us a ring today on 0114 261 7617, email us at rich@imagesignstudio.com or see our signs gallery for examples of our signage for yourself.